Variable spring weather is a constant for migrating birds. When the hummers arrive, their observers are excited to see them! It’s spring and there has been a lot of migrant activity. While some Ruby-throats have pushed north into Michigan, Illinois, and Iowa, the majority of reports (over 90) this week are from fallouts observed south of 40 degrees latitude. 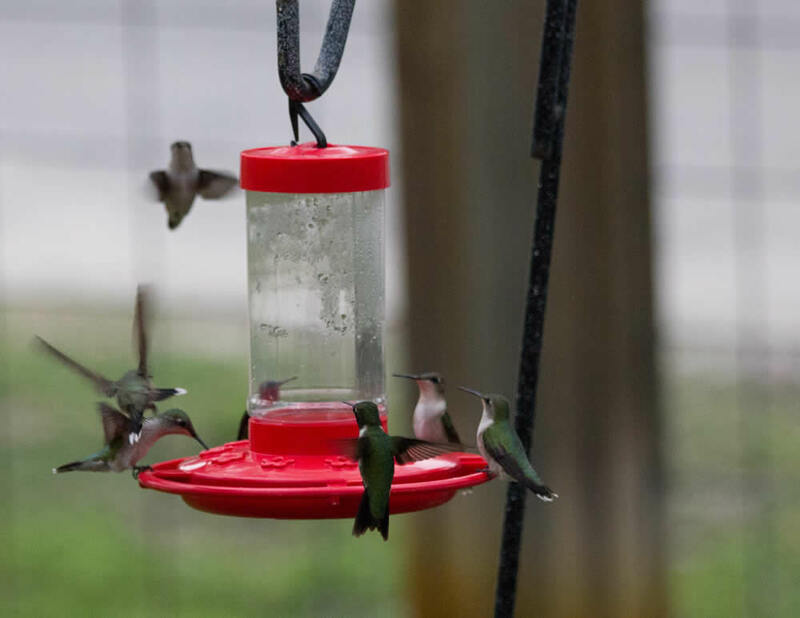 Slow moving storm systems have kept migrants holed up along the Gulf coast, and one reporter shared the photo above from Texas to show the large numbers of Ruby-throats at their feeders. “I saw a female hummer visiting the feeder all day - in spite of being a very rainy day.” Virginia Beach, Virginia on April 24th. “First male hummingbird was sitting on the window feeder this morning at 7:00. It was 35 degrees. This was a full 5 days earlier than last year, despite the weather.” Chatham, Massachusetts on April 23rd. “I had my first male hummingbird today. Funny how one tiny bird can bring such joy.” Newburgh, Indiana on April 24th. “My juice bar is open for business. Attention all hummingbirds. please come see me!” Otis Orchards -East Farms, Washington on April 21st. “We have been waiting and finally they have arrived. Happy season to all!” Connersville, Pennsylvania on April 24th. As more Ruby-throats are arriving from across the Gulf, early birds are beginning to build nests and start families. Keep a watch for nesting behavior.